Service dogs have a long history of helping people who are blind or afflicted with some other type of physical handicap. Service dogs keep people safe – they alert diabetics when their blood sugar is spiking, help those who are blind safely walk city streets, and guide those who are disabled. They’re allowed in every store, can come with their owner every day, and even get some special pup perks. There’s also a perk most people don’t know: anyone can turn their dog into a service dog. If you want your pet to become a service dog, it’s surprisingly easy to do – you can register your pet as an emotional support dog or a therapy dog. Once your dog is officially registered, you can reap the benefits. 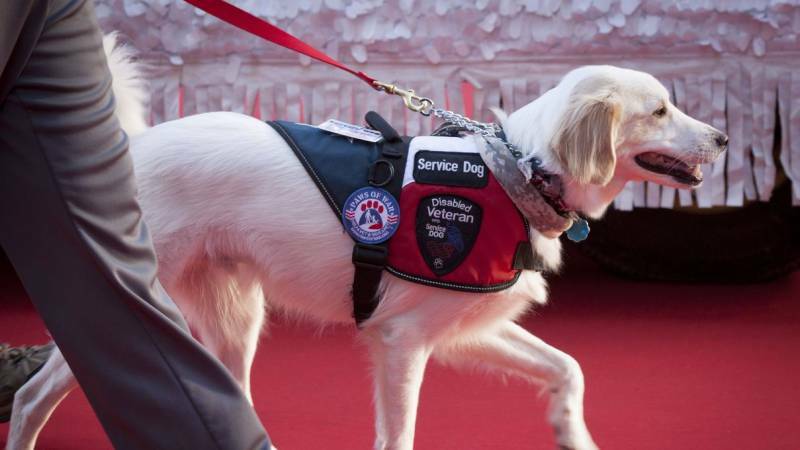 Here’s what you need to know about each of the different types of service dogs before getting your pet registered. All landlords must allow service animals without charging extra rent, regardless of whether they allow pets. Airlines must allow service dogs to fly for free. How Can You Register Your Animal as a Service Dog? To become a service dog, the ADA does not require any specific training. However, to become registered with the United States Service Dog Registry3, you and your dog must spend at least 120 hours undergoing training. The process takes a minimum of six months and at least 25 percent of your pup’s training needs to happen in a public setting. Once your dog can perform every required task to perfection, you can register them with the United States Service Dog Registry for free. Emotional support dogs don’t perform the same tasks as service dogs. Instead, their primary function is to provide support and comfort through affectionate interaction. Any even-tempered dog that demonstrates the ability to offer comfort as needed can become an emotional support dog – and whose dog doesn’t want to offer love and comfort? How Can You Register Your Animal as an Emotional Support Dog? There are no professional training requirements for an emotional support dog. You just need a letter from a doctor; the letter should recommend an emotional support dog for one of the many qualifying conditions, including depression, anxiety, bipolar disorder, panic attacks, and PTSD. Therapy dogs are growing in popularity – they’re used in airports during the holiday season, accompany children in classrooms, and even participate in stress relief programs. These dogs work closely with their handler to offer much-needed help to people suffering from mental or physical health issues. Often, these dogs are deployed to assist people who are dealing with trauma or stress. Unfortunately, therapy dogs don’t get any special legal benefits; they can be denied from public places, apartment buildings, and airlines like a regular dog. How Can You Register Your Animal as a Therapy Dog? Therapy dogs team up with their owner to offer support to other people. They aren’t specially trained to perform any tasks for their owner. There are no specific certifications for therapy dogs, but many organizations require them to be registered with the United States Dog Registry. Your dog can become one of the above types of service dogs. With some training, the appropriate registrations and certifications, and the right skillset, it’s easy. Consider getting your dog registered now – as a service dog, an emotional support dog, or a therapy dog. The process is easier than most people think, and it’s just a matter of starting on the path. You can research before you begin. An online search can teach you about the process, its requirements, and the options available to you. Interested in beginning the process of registering your dog as a service dog? Start a search today.